When we chose to collaborate on this woven clutch for the 2017 holiday gift we had no idea how far the impact would reach. 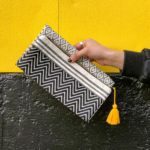 Not only were our clients delighted with a beautiful and ethically sourced handbag, but in choosing this clutch, we helped employ dozens of women artisans in Jaipur, India for three months. These are women who might otherwise not have financial independence or choices about their employment and future. As a majority female owned and operated company, and having a large audience of female clients, this hits close to home and warms our hearts in ways we can’t even begin to explain. We all know the magic that women are capable of creating when we can live free of worry and with choices about our homes, families and future. We are grateful for the opportunity this partnership afforded us to give, and grateful for all our wonderful clients who give us a reason to celebrate and give back each year. When women help women, amazing things happen. I read this article and found it very interesting, thought it might be something for you. The article is called Women Helping Women and is located at https://www.canarymarketing.com/social-impact/women-helping-women/.